Annual Fund Update: Off to a Great Start! We want to express our gratitude for all of the generous donations we have received so far for the Chabot Annual Fund. We are off to a strong start, but we have a long way to go to reach our goal for each class to achieve 100% family participation in the Annual Fund. 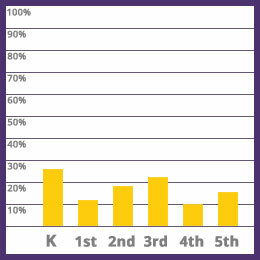 The kindergarten class has the lead at 26% participation. Way to go families! Check out the participation banner at the front gate or here for weekly class participation updates. Help your class reach 100% and donate today. Donations in any amount are welcome. More exciting news to come about the annual fund campaign! Stop by our table this Friday morning to ask any questions or make a donation.